When you’ve been together as long as ‘Punch The Air’ you don’t half accumulate a lot of brilliant party band images. This is why we’ve had to split our collection of photographs in two. Below you’ll find links to pages firstly featuring newer images, then a page of older pictures. Most of our images are not close ups of the band but of the actual audience dancing along and enjoying our live performances. We want to show you their honest reactions to our live show in our photos. Its never about us, its about you and your guests having an amazing time. 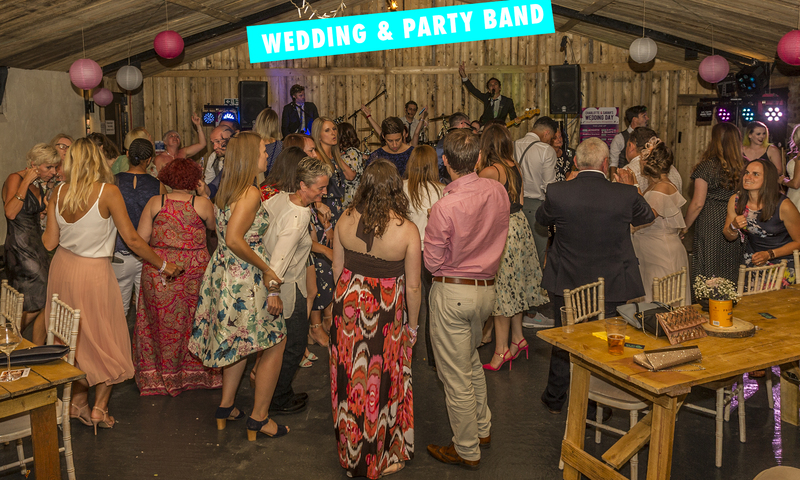 As you’ll see from our party band images we get everyone up and dancing and even let them on stage with us from time to time. We want everyone to be enjoying themselves as much as possible at your event. Images 2017-2019 – Our most recent photos from lots of great events. Images 2016-2012 – Older images from a little while ago. Photo by Claire Taylor Photography. Dont miss out on important photos for your event. Did you know that most photographers head home just after the band gets started when the 1st dance has finished at weddings? Unfortunately this fails to capture some of the most fun moments you’ll see during your special day. 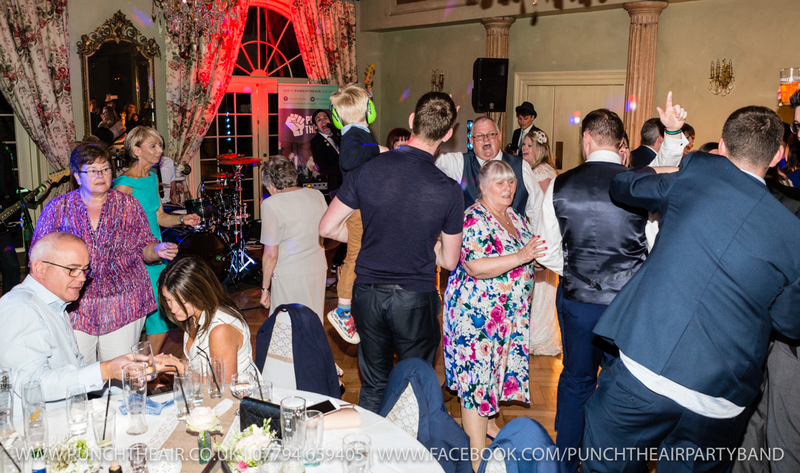 Including guests letting their hair down and throwing up some amazing shapes on the dancefloor as we perform live. You wouldn’t want to miss out on these once in a life time photo opportunities would you? This is why we’ve partnered up with an amazing professional photographer and we’re able to offer you a really great deal on an “Evening Only” photo session. Our photographer Claire Taylor has a degree in photography from Nottingham Trent University and lots of live music experience. She has provided many of the amazing images you’ll see across our site. Claire is able to provide you with digital copies of all the images she’s taken in under a week. Just advise when contacting us if you’d like a quote for our evening only photography deal. Claire can also booked alongside us for any type of event day or evening such as parties, corporate events or birthdays. 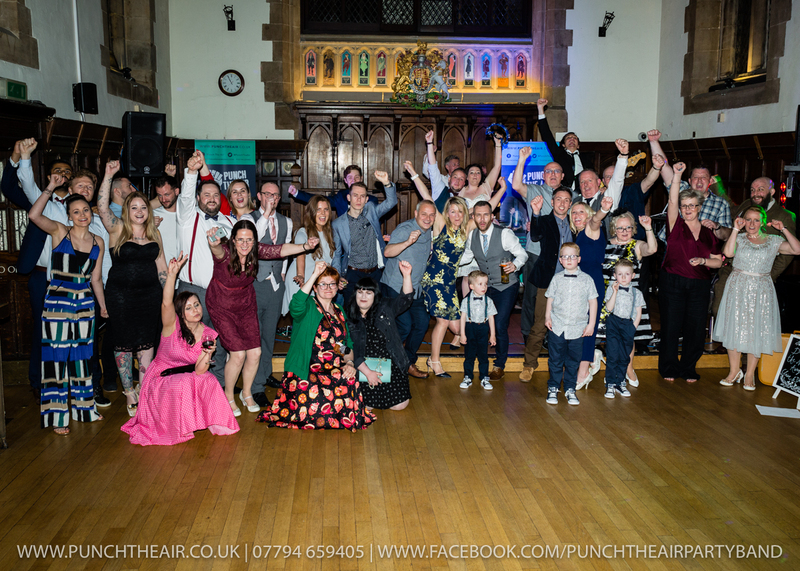 You can see even more party band photos of ‘Punch The Air’ performing live on our Facebook, Twitter and Instagram profiles. If you have any questions then you can hop on over to our Frequently Asked Questions page. You can even speak to us over on Facebook if you like.